Recently, journalists reported on the creation of special fuel for hypersonic vehicles and missiles, as well as the creation of an oxygen-free engine for the PAK FA fighter jet. At an airshow in India, it was revealed that a Russia-India joint venture was entering the final stages of work on a hypersonic missile. These interrelated events suggest that Russia is fully involved in the creation of hypersonic weapons. Maxim Kuzyuk, CEO of the Aviation Equipment Holding (part of the state corporation Rostec), believes that the PAK FA engine can start without oxygen. “When creating the PAK FA, we were set the task of developing an oxygen-free starting system. Plasma ignition systems are installed in the main combustion chamber and the afterburner. This innovation is integrated into the nozzle with the plasma system – inside it, simultaneously with the admission of kerosene, a plasma arc is created,” said Kuzyuk. He underlined that this is a “unique” system, with no analogues anywhere in the word. Kuzyuk also noted that this would lead to significant savings in monetary terms and, which may be even more important – reduced weight, because there is no need to install special oxygen equipment on the plane itself, thus making unnecessary the deployment of corresponding terrestrial infrastructure. However, an oxygen-free engine starter is not only about money savings. This is also one more step in the creation of hypersonic vehicles, for whose engines this technology is critical. The whole world is following the testing of the American X-51 hypersonic missile, which in recent test flights achieved a stable cruise speed of Mach 5.1. Similar work is being done in Russia as well, but all of this is strictly classified. No one even knows the proposed name or code identifier of the future product. A model of such a missile was shown at some exhibitions in the early 2000s – the Kh-90, but three years ago, its creator, the MKB Raduga, has repudiated any further connection with this project, saying that the work had stopped a long time ago and that the company is unaware of any other work in this direction. Furthermore, back in 2013, Russian Deputy Prime Minister Dmitry Rogozin said that “tests are being performed”, but these are “strictly classified, and Russia is not lagging behind the USA in this sphere”. The news media reports about the oxygen-free motor for the PAK FA seem to be the “reverberations” of these tests. In addition to this, last week Deputy Defense Minister General Dmitry Bulgakov stated that Russian scientists had developed a recipe for a new fuel, which will provide hypersonic vehicles with speeds surpassing Mach 5. The press reported this piece of news, as if in passing, among other successes achieved by Russian chemists, like a more economical fuel for cruise missiles, or work on the replacement of oil in the production of a number of fuel components. Meanwhile, Russia faces the task of developing new fuels for one of the fastest fighter jets – the MiG-25 (MiG-31). A special jet fuel was developed in order that these types of aircraft can attain speeds close to Mach 3. The clearest news about the progress Russia has made on hypersonic weapons was reported, oddly enough, in India. During the Aero India-2015, Sudhir Mishra, Head of BrahMos Aerospace Ltd, announced that the development of a hypersonic missile would take from eight to ten years. “This will be the first hypersonic missile in the world,” he added. BrahMos is a joint Russia-India project. 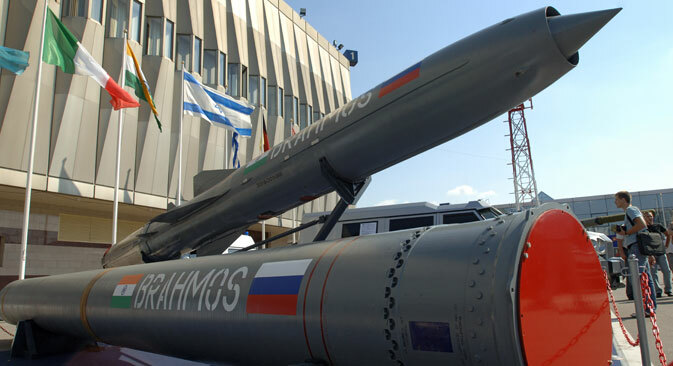 Starting in 1998, the BrahMos was based on the Yakhont missile (export version of the P-800 Oniks missile), and has been developing missile weapons for the needs of the Indian Army. Taking part in this development from the Russian side is the Moscow Aviation Institute. It is logical to assume that the Russian side would hardly “share the latest developments” with Indi. Mishra is perhaps exaggerating in saying that the BrahMos will become the world’s first hypersonic missile. The US is close to creating a prototype and Russia is also moving in this direction.